Both sexes: Sooty-brown plumage with scythe-like wings and short forked tail. 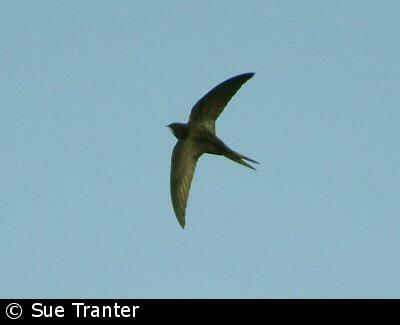 The fast, high-flying Swift is more likely to be seen as a scythe-like (crescent) silhouette against the sky. They are often in parties, swooping, screaming and chasing one another all day long. The Swift is almost uniformly sooty-brown apart from a whitish throat. The beak is small but the gape is very wide and perfectly adapted for catching flying insects. They have a forked tailed, but it is not as forked as the Swallow's. The bill and legs are black. Juveniles have a pale eyebrow. Swifts' wings are so long and their legs so short (in fact, relative to their body size, they have the shortest legs of any bird) that they are unable to walk or take off from the ground. If you find a Swift on the ground that is not obviously injured, pick it up, place it on your hand with the bird facing forwards, and slowly raise your arm up and down to encourage it to take off. Watch out for the bloodsucking louse flies among their feathers. Their call is a harsh, piercing screaming "shreee". They feed exclusively on spiders (carried on the wind) and insects caught on the wing. When it is warm, the insects are carried to higher altitudes by the thermals. When it is colder, the insects are nearer the ground. They nest in holes in walls or under eaves. The nest is made from grasses, leaves, and feathers - all collected while flying - and bonded together with saliva. Breeding is the only time Swifts stop flying; their entire lives are spent in the air. Artificial nest boxes can be purchased that either fix to walls or replace a house brick. The eggs are white, smooth and non-glossy, and about 25 mm by 16 mm. The male and female take turns incubating the eggs, and both adults feed the young. They are another summer visitor; arriving in late April and leaving in August to spend the winter in Africa (see migration). Before it was discovered that they migrated to Africa, it was thought that they hibernated in the mud at the bottom of lakes. Their conservation status is not known accurately owing to the difficulty in surveying a bird that spends its life flying. However, indications are that the population has declined in recent years, especially in England and Scotland.